The Church of St Eustace in Paris. The present building was built between 1532 and 1632. Charles Saucier, patriarch of the present day Saucier family, attended church and was the organist at Saint Eustache Cathedral in Paris. He was an organist/musician and is listed in the directory of Medieval Musicians of France in the early 1600’s. It is believed that Charles Saucier and his family lived in a home located in Les Halles Pillars directly across from the church in the market place area. Charles would not only play for church services and events but would also have been the mechanic who maintained the Organ and its Pipes and kept it in good working order. His position as organist, a highly respected position, would have required him to spend his work day there in the church at a higher than modest pay. Saint Eustache Cathedral is located in the Les Halles neighborhood and market place of Paris, an area that was once renowned for fresh produce of all kinds. The church became a parish church in 1223, thanks to a man named Alais who achieved this by taxing the baskets of fish sold in the nearby market. To thank divine generosity Alais constructed a chapel dedicated to Saint Agnes, a Roman martyr. The construction of the current church began in 1532; the work was not completed until 1637. The name Saint Eustache refers to Saint Eustace, a Roman General who was locked along with his family inside a giant bronze bull statue that was set afire, burning them all alive for converting to Christianity. 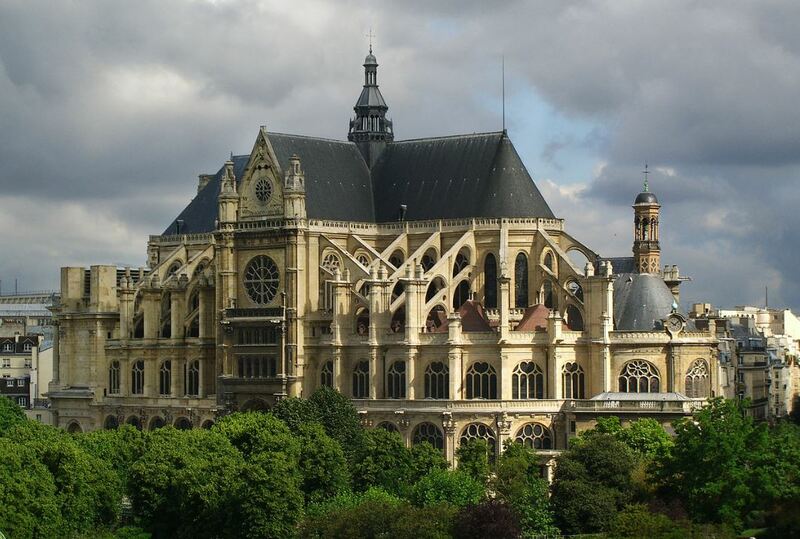 Saint Eustache is Located not far from the royal palace and world famous Notre Dame Cathedral. The Church, a large and impressive building is second only to Note Dame Cathedral. The Church, situated at the entrance to Paris's ancient market place is considered a masterpiece of Gothic architecture. The church’s reputation was strong enough for it to be chosen as the location for a young Louis XIV to receive communion. Mozart also chose the church's sanctuary as the location for his mother’s funeral in 1778. Among those baptized here as children were Richelieu, Jeanne-Antoinette Poisson, the future Madame de Pompadour and renown French author and actor Molière, who was also married here in the 17th century. The last rites for Anne of Austria, queen consort and mother of King Louis XIV were conducted here in 1666. According to tourist literature on-site, during the French Revolution the church, like most churches in Paris, was desecrated, looted, and used for a time as a barn. The church was restored after the French Revolution had run its course and remains in use today. Several impressive paintings by Rubens remain in the church today.